(CNS): The deputy governor is hoping to hit two birds with one stone for his inaugural 5K Challenge by encouraging civil servants to get fitter and healthier and at the same time help Derek Haines in his goal to reach $1m to build an in-patient care centre for the local hospice. Franz Manderson, who has been on a fitness drive of his own, has also been instrumental in helping his staff improve their wellbeing by introducing various health initiatives. “This challenge is launched in keeping with my goal to have a healthier, more active civil service,” the deputy governor said. “It has been extremely pleasing to have so many civil servants join me on this journey towards health and wellness by participating in the various community fitness initiatives over the past few years, including the InterTrust Marathon and many walks/runs. We, as civil servants, now have the opportunity to host our own fitness initiative, in the form of a 5K walk/run," Manderson added. He explained that the event provides an opportunity to help Derek Haines in his own challenge to raise $1 million this year by running six marathons. Manderson said the theme for his challenge was "Running for the New Hospice". “To support Derek Haines in his campaign, I will be donating the funds raised from the Deputy Governor's 5k Challenge to Derek's campaign to raise funds for the new Hospice Care building,” he said. Registration forms will be available on the Cayman Active website, as well as the Department of Sports. Scheduled registration will also be held the week before the event at the Government Administration Building. See more details on flyer below. (CNS): A woman convicted of causing death by dangerous driving who was handed a five year jail term last month has been released from prison on bail because she has a genuine chance of winning an appeal. Dorlisa Piercy was convicted of causing the death of Karen Edwards, who was seven months pregnant when she was thrown from a car during a major smash in East End in 2011, as a result, the judge found, of Piercy's dangerous fast driving. However, the chief justice found that the appeal filled by her attorney, Lucy Organ of Samson McGrath, had a legitimate chance of success and met the requirements to allow bail pending the hearing set for November. He therefore placed Piercy on conditional bail, allowing the young mother to return to her 17-month-old child. Piercy was convicted after trial, when she denied being the driver and was then handed one of the most severe sentences in any recent death by dangerous driving case by the visiting judge, Justice Carol Beswick. Despite being a breast feeding mother, she was jailed for five years. Organ argued in the appeal that the judge had erred in her findings on five different grounds but in particular that there was no evidence of dangerous driving. Piercy, if she was the driver, was found by an expert witness to have been driving in a 50mph zone at around 65 mph. But with no other hazards on the road and in daylight, speed alone is not sufficient to find dangerous driving, according to the law accepted by the judge. Organ said the judge had called on common sense as a result of the damage to the car and inference from witnesses that Piercy was driving much faster than 65mph but there was no indication in the ruling to show how the judge had found that she was driving so fast it could amount specifically to dangerous, calling the conviction into question. Chief Justice Anthony Smellie made it clear that his opinion had no bearing on the success or failure of Piercy's appeal, merely that there was a prima facie case – or sufficient grounds for an appeal to be heard. Therefore, in line with the requirements of the bail law relating to the circumstances of someone already convicted of an offense being released, the CJ said they had been met and ordered Piercy's conditional release. She was bailed to reside at her West Bay home and to report twice per week to the West Bay police station. Piercy was directed to surrender her passport to put up a surety bond of $20,000 and to be placed on an electronic tag with an 8pm to 8am curfew. During the trial of Piercy the court had heard that she and another passenger in the car were very badly injured in the smash, which had thrown Edwards, who was not wearing a seatbelt, clear of the car and killed her instantly. Piercy was not under the influence of drink or drugs at the time of the smash and there were no other hazards on the road. 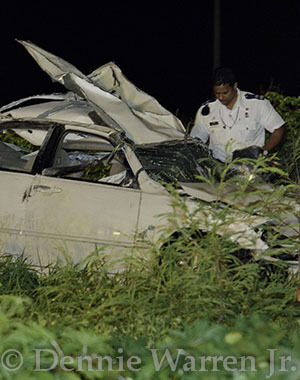 Experts were unable to ever determine exactly what speed the car was traveling when it came off the road and hit a palm tree on Seaview Road in the Lovers Wall area. Although experts made certain estimates, the failure of the police to preserve the car in evidence and have it scrapped before experts for the defence were able to examine it and long before the case came to trial, the accident reconstructionists were left with only half of the story. (CNS): The weapon seized by police officers investigating the firing of a gun during the Batabano Carnival at the weekend say that the gun they recovered was a licensed firearm but they have yet to verify whether it was the one used by the alleged shooter. Twenty-nine-year old Todd Bowen from Prospect has been charged with attempted murder, unlawful use of a firearm and possession of an unlicensed firearm in connection with the incident in which he allegedly fired a gun on a crowded street during the festivities on Saturday at around 7pm. However a gun recovered from his home during a police search in the wake of the shooting is a licensed weapon though sources tell CNS it is not licensed to Todd Bowen but to a relative. Police say they have yet to verify if the weapon they seized during the search is the weapon Bowen is believed to have used but as at least one bullet was fired at a tree in the area police have the means of identifying the weapon used in an incident which unnerved the community. Although no one was hurt in the shooting the fact that it was fired on a very busy street in downtown George town in the area of Dr Roy’s drive and Edward Street as residents and visitors were out enjoying the carnival raised concerns for the police who are still trying to find more witnesses. The senior investigating officer DCI Malcolm Kay said the number of people in the vicinity at the time of the shooting means that there must be more witness still out there that saw what happened and he is urging them to come forward in confidence. Anyone that thinks they can help with information regarding the discharging of the weapon is asked to contact DCI Kay or DC Andrew Graham at the George Town CID at 949-4222, or to remain anonymous to call Crime Stoppers 800-8477(TIPS).